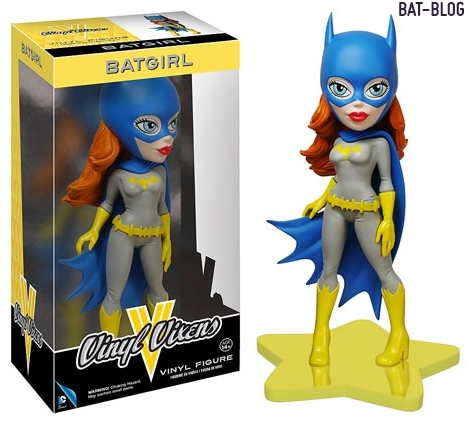 BAT - BLOG : BATMAN TOYS and COLLECTIBLES: #FUNKO TOYS is Adding #BATGIRL FIGURE To Their DC Comics VINYL VIXENS Toy Line!! #FUNKO TOYS is Adding #BATGIRL FIGURE To Their DC Comics VINYL VIXENS Toy Line!! Here's some really great "Batman Toy Collector" news!! Later this year, FUNKO, who we totally love, will be adding BATGIRL to their VINYL VIXENS toy line. You might remember that they came out with Catwoman, Harley Quinn, and Poison Ivy figures earlier and they sold out pretty quickly! (I never got any). This BATGIRL figure will measure approx. 9 Inches Tall and will be available around September, 2015. Oh yeah, it will have a Retail Price of about $29.99.